Alison completed our Manchester Cyclone24 this May. 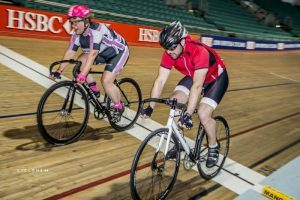 She started cycling at 53, and by 55 decided to hit the velodrome track! By the looks of things, she has not looked back as Alison is now a regular on the track, in sportives and club rides. There is no stopping her! Here Alison shares her Cyclone24 experience. I am a member of the Derby Velodrome ladies track community and it was advertised on our Facebook page. I’ve also attended some ‘ladies only’ sessions run by Kate Samways and she also shared information about it. I an 57 and only started riding a bike at 53. I hadn’t done any exercise since I was a teenager and found I couldn’t ride half a mile without getting out of breath. I was shocked….. but didn’t give up. I set myself manageable small targets – 5 miles, 10 miles, 15 etc. I really didn’t mean to get hooked…. but I did – it feels great. I now have 6 bikes including a BMX. I started track about 18 months ago – I wasn’t sure I’d even let go of the rail – I mean – who in their right mind rides a bike with no brakes, gears or freewheel…. at my age! Strangely I found that I felt more in control of the bike and found it exhilarating. Again I set myself small targets and gradually worked my way through the accreditation at Derby progressing to track league. Despite not being the fastest I find a real sense of freedom with my riding and it’s helped both my physical and mental health in a positive way. I’m much less stressed these days. I was keen to try the Cyclone 24 event at Manchester as the thought of being part of a relay team, raising money for charity, working together and motivating each other to get through 24 hours was another of those things I wanted to have a go at. It was also a chance to ride at Manchester and on the track over a 24hr period – I thought I’d be unlikely to get that chance again and wanted to see what I could do. I had several track sessions, concentrating on 15/20 minute endurance sessions. Riding track is exhausting as you need a certain speed just to stay on track. As part of a team I would have to be on track for 15/20 minutes a time over a whole 24hrs – so pacing was important to make sure I finished. I also read up on nutrition – it’s important to stay hydrated and eat little and often so you don’t have too much weighing on your stomach at any one time. The buzz, the encouragement and support of everyone pulling together. The sheer exhaustion when driving home after no sleep (I pulled over and had a nap!). The feeling of fabulous achievement on getting home and realising that I personally had ridden 101 miles on a Velodrome track – that was awesome! Not really – I’m more of a Laurine-Van-Riessen fan – she was the rider who almost ended up in the crowd at the Olympics by riding up the top barrier! I seemed to get a second wind – one of my work colleagues came along to see me and it spurre d me on. I could see the clock ticking and was thrilled to be one of the riders on the last session – the crowd and other riders were amazing and the hairs on the back of my neck were tingling. I almost burst into tears at the end as it was so emotional. Be prepared – riding a fixie, even on the black line’ is hard work – even for 15/20 mins a time. 24 hrs is a long time – so don’t go all out too early. Make sure you take a fold up camping chair and a blow up airbed (I didn’t use my sleeping bag but it was good to know I had it). Make sure you bring enough snacks (and know where the nearest 24hr supermarket is). Bring several changes of cycling kit and a wash kit/towel – it’s amazing how freshening up helps to rejuvenate you. Most of all I’d say – have fun, enjoy it – don’t take it too seriously.